Market anxiety about the economic outlook has put a question mark over consensus earnings expectations. Estimates have been coming down lately, reflecting the impact of economic weakness and rising costs. Many in the market suspect that earnings estimates likely need to fall a lot more before stabilizing. A lot will depend on company guidance and management’s discussion of business conditions on earnings calls in the Q4 earnings season, which takes the spotlight with next week’s releases from the big banks. Total Q4 earnings for the S&P 500 index are expected to be up +11.8% from the same period last year on +5.6% higher revenues. Estimates have been coming down, with the current +11.8% rate down from +15.9% at the start of the quarter. The negative revisions trend is widespread, with estimates for 15 of the 16 Zacks sectors coming down since the quarter got underway. Estimates have come down the most for the Conglomerates, Construction, Energy and Consumer Discretionary sectors. The Transportation sector is the only one experiencing positive estimate revisions, a reflection of weakening oil prices. The strongest year-over-year earnings growth in Q4 is expected to come from the Energy, Transportation, Construction, and Retail sectors. Excluding the Finance sector’s strong growth, Q4 earnings growth for the rest of the index comes down to +9.6% (from +11.8%). For the small-cap S&P 600 index, total Q4 earnings are expected to be up +7.1% on +6.5 higher revenues. This would follow +33.6% earnings growth on +5.7% revenue growth in Q3. 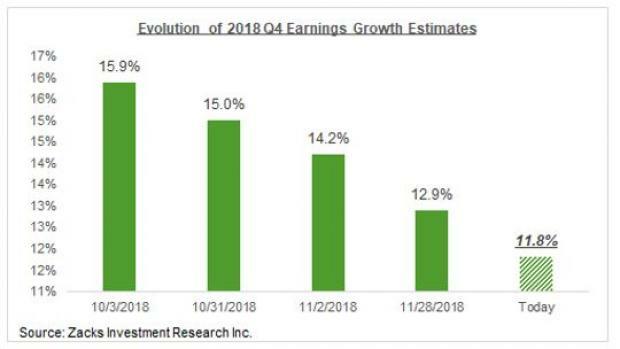 For full-year 2019, total earnings for the S&P 500 index are expected to be up +7.5% on +5.9% higher revenues, which would follow the +20.7% earnings growth on +6.9% higher revenues in 2018. Estimates for 2019 have been steadily coming down, with the current +7.5% growth rate down from +9.8% in early October 2018. The implied ‘EPS’ for the index, calculated using current 2018 P/E of 20.7X and index close, as of December 31st, is $157.70. Using the same methodology, the index ‘EPS’ works out to $169.52 for 2019 (P/E of 7.5X) and $186.62 for 2020 (P/E of 10.1X). The multiples for 2018, 2019 and 2020 have been calculated using the index’s total market cap and aggregate bottom-up earnings for each year. Just as FedEx (FDX) did in its recent earnings report, a number of major companies provided weak guidance at the time of the Q3 earnings season, blaming factors like the impact of the strong U.S. dollar, cost inflation (particularly on the freight front) and trade tariffs. Questions about the international economic growth backdrop has emerged as an additional headwind to corporate earnings. As a result, estimates for the December quarter as well as full-year 2019 have been coming down for operators like Caterpillar (CAT), Honeywell (HON), 3M (MMM) and others. This is showing up in the aggregate revisions trend for the index as well, as the chart below shows. The magnitude of negative revisions that we have seen for 2018 Q4 is not unusual in a historical sense, though it is high and more widespread relative to what we have been seeing over the preceding three quarters. The bigger issue will be how estimates for the coming quarters hold up going forward, particularly given the emerging late-cycle narrative of slowing economic growth or even a recession on the horizon. 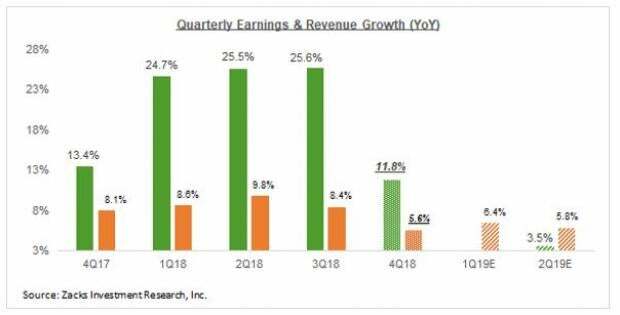 The growth pace was expected to decelerate in 2019 already as the direct benefits of the tax law changes faded, as the chart below of quarterly earnings and revenue growth show. But even these low growth expectations for the coming quarters are vulnerable to further downward revisions. In other words, it is reasonable for market participants to nurse some doubts about the current earnings backdrop.